I have just recorded a new CD. It will be my 7th and I can't wait for you all to hear it. In the meantime I thought I might just tell you a little about the new songs I have written for it. I first heard about this true story when I saw a photograph reproduced below. 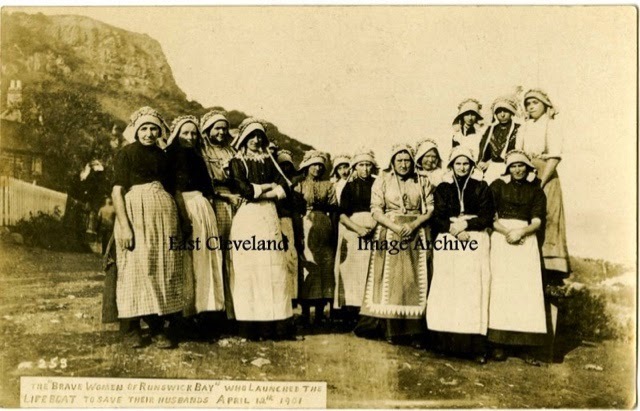 It showed a group of fishergirls and had the caption 'The Brave Women Of Runswick Bay.' On 12th April 1901 the fishing fleet set sail from Runswick Bay in bright sunshine. Unfortunately a freak squall came in and the fleet were in danger. Because all the men were out fishing only the older men of the village and young boys were left to man the lifeboat. It was left to 20 or so fishergirls to launch the boat. It involved dragging the incredibly heavy boat into the water putting themselves in great danger. The lifeboat guided the boats back to shore and the fishergirls waited on the beach until every last boat returned.